What follows might be seen by some as an advert for Azoth Art. But I am a little concerned that an important online craft company might go under thanks to the wonders of Google and the search engine industry. For some reason Azoth Art has disappeared from the search engines and its owner Cathy is fast finding that her work is drying up. It is taking some time to sort the mess out too. 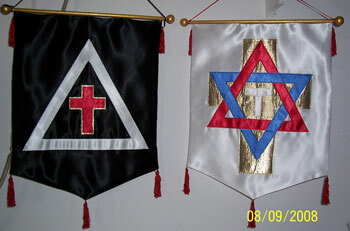 To those who do not know Azoth is responsible for most of the sewing within the Golden Dawn community. To my knowledge all the Hermetic Order of the Golden Dawn and the Magical Order of the Aurora Aurea all use robes, nemsis, sashes, banners and other things made by her. She is quick, accurate and has saved hours of frustration and blood for those of us who cannot sew. She has also helped us develop items which would have been difficult to make but were important to the development of our Second Order. Cathy’s stuff is well made too. I still have a set of banners which were given to me 20 years ago and have survived regular use and travelled to workings in four countries. The site is definitely not optimized for search engines, especially not the current Google best guess model (because Google never actually tells us what they are looking for–it is always just a best guess from the experts). The site needs redesigning something fierce. I would say more, but it would just sound mean…even if the discussion was taken private. Kathy does excellent, high quality work and I wouldn’t dream of going anywhere else for the things she supplies. I hope that somebody will step up to the plate and do their fraternal duty to give her a hand in optimising her site, as she well deserves our support. There’s pieces on the Wayback Machine & the site was very graphics based which makes sense for a designer of tagible stuff. Nothing to do with Google. I tried opening it in Safari on my iPhone just now and it still didn’t work. Might I suggest that there is something wrong with the servers at http://www.azothart.com itself rather than Google. Funnily enough, though, I did get onto the site successfully on my iPhone this morning, so the problem seems to be intermittent. Kathy has always done great work for me. The Sashes we use in our temple all come from her and I have one of her robes that I am immensely pleased with. Right now the site pulls up fine in 3 different browsers for me and when I do a google search on Azoth Art it comes right up. I couldn’t be happier with my robe and nemyss from Azoth Art. Cathy’s work is as good as anybody’s. The one thing I’d add, which Nick didn’t mention in his post, is that Cathy is also extremely warm and pleasant to deal with. So at Azoth Art you get that rare nexus of quality craftsmanship, reasonable prices, and fantastic customer service. If you’re looking for a robe, altar cloth, banner, or any other fabric implements, you’ll be doing yourself AND THE REST OF THE OCCULT COMMUNITY a favor by clicking on the link in Nick’s post. God bless.